Guess what I have for you today? More nail art! 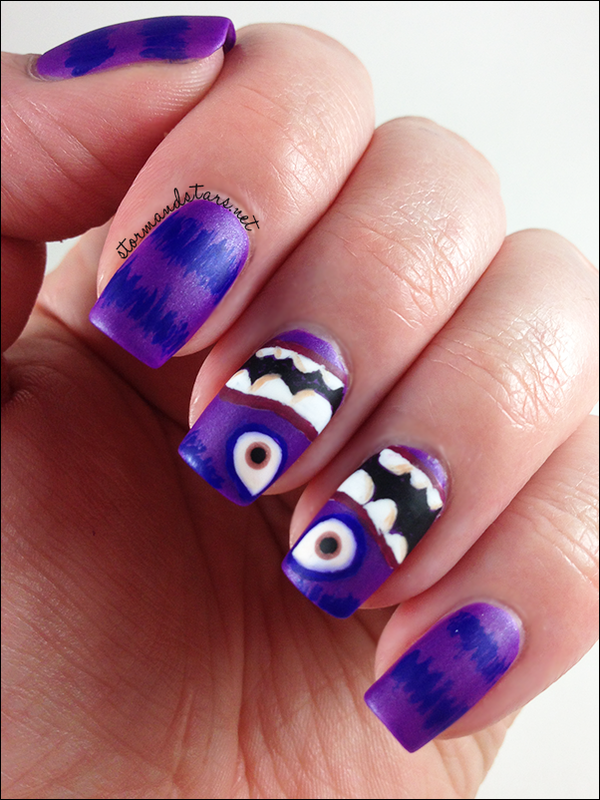 A while back one of the wonderful ladies I follow on Instagram asked if anyone wanted to do Twin Nails with her. I love doing things like that so I volunteered. We had a few setbacks, but settled on a topic and today is the day! I'll be posting here and on Instagram, and be sure to check out @perlarobeles nails on Instagram as well! We decided to do Monsters, Inc. as our theme. I absolutely love both movies, but MU is fresher in my brain so I went with a character from that. I must have gone through about 10 designs in my head before I drew out 3 of them and finally decided on one. My Inspiration is a photo of Art from Monsters University that I found here. Are you ready to see? Ahhhhhhhhhh! I love love love how they came out! I didn't have the exact right colors for this, but I started with a base of Illamasqua Poke topped with one coat of Seche Vite on all of my nails. I used a tiny brush and some thinned out Revlon Royal to make the furry stripes on all my nails except the ring and middle fingers. 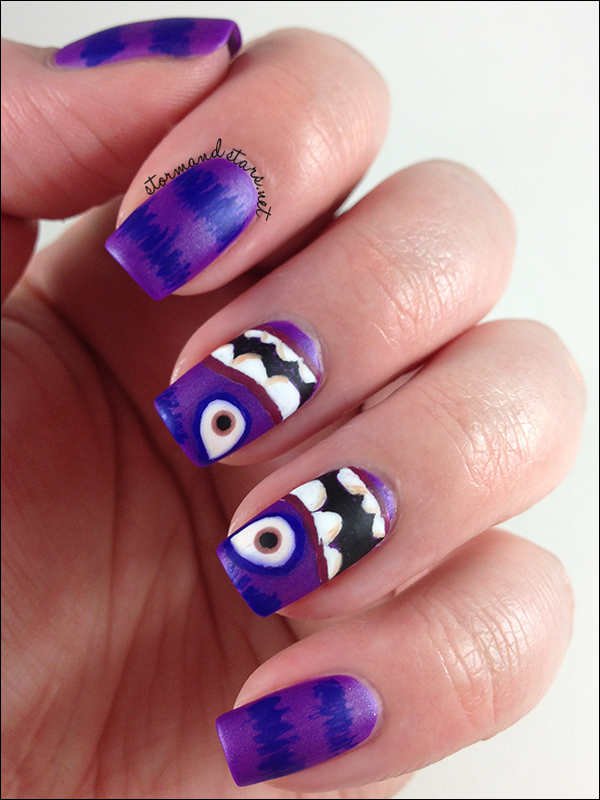 I added the outline of one eye on each of those fingers with Royal and the eyebrows above them. 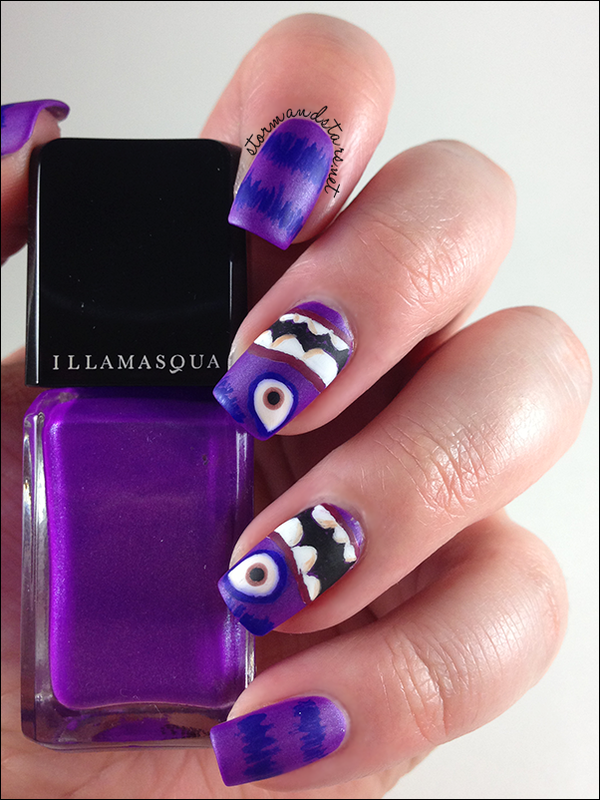 Once all that had partially dried I added in the white eyeballs with Cult Nails Tempest and outlined the mouth in Illamasqua Vice. 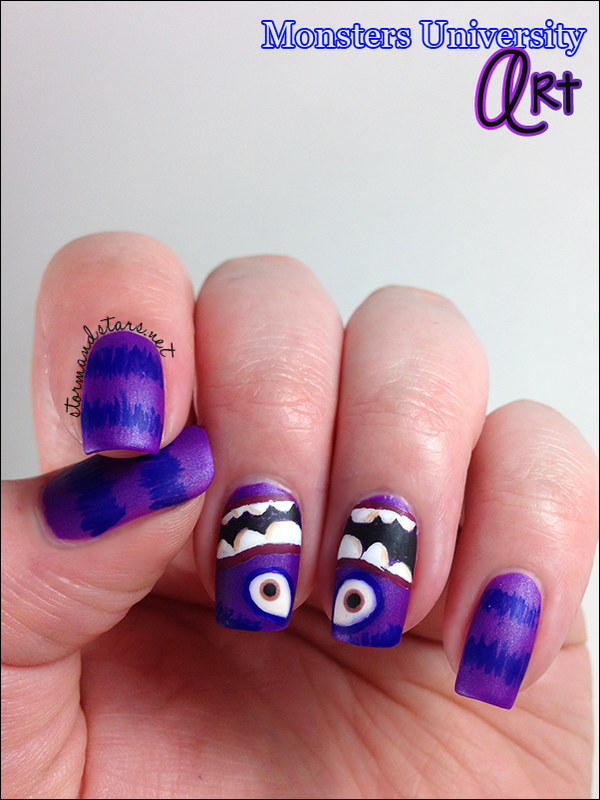 I went back in with Cult Nails Tempest and added the teeth, which I added definition to with Cult Nails Baker.After the eyeballs were dry I used a large dotting tool and Zombie Darlings Mystic Chocolate to make the eye, then a medium dotting tool and Cult Nails Nevermore to make the tiny black pupil. I let the whole thing mostly dry then added one coat of Seche Vite. Again, I let that dry to the touch, then I added a coat of matte topcoat so it wasn't shiny. He looks kinda scary like this haha! I'm so glad I finally took the plunge and did some more detailed nail art. It was so much fun and I really love the results! What do you think? Did you see the movies? 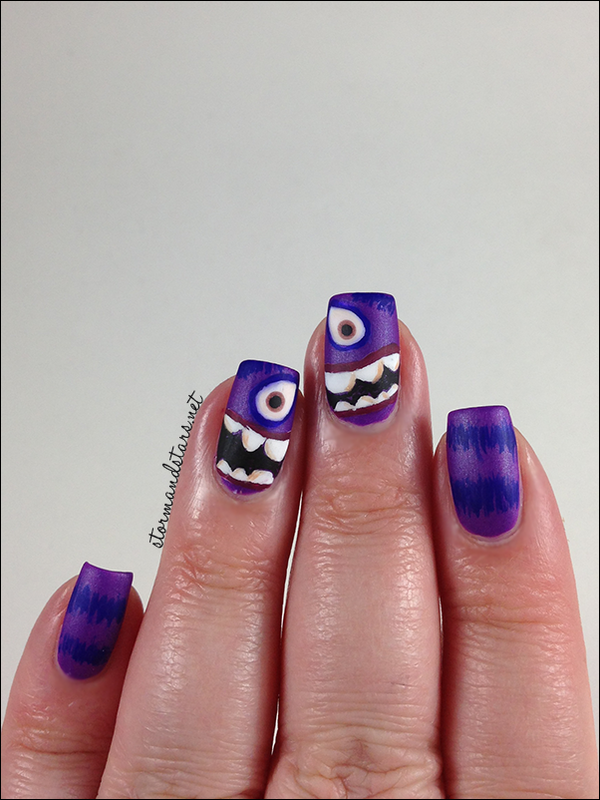 Have you done your own Monsters Inc or Monsters University Nails? I'd love to see them!